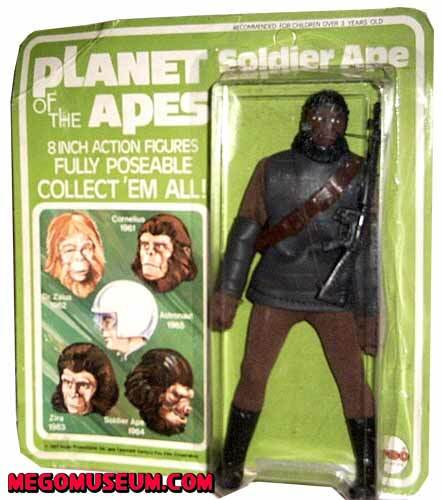 Soldier Ape ( Item Mumber 1964, assortment number 1960) packed 6 per case. 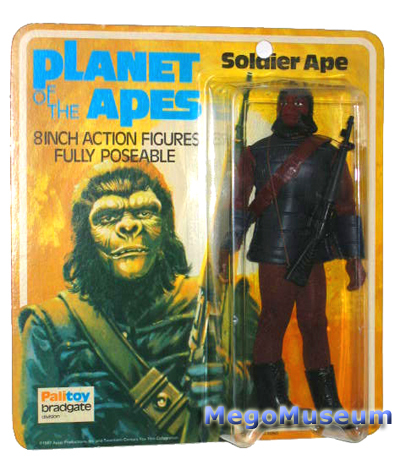 Soldier Ape was the ‘all-purpose Gorilla’ of Mego’s first line of Ape figures. 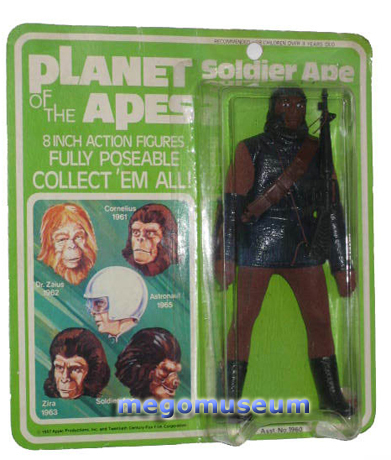 The original Planet of the Apes movie, on which the entire first line was based, had many identically clad Gorillas who functioned as hunters, soldiers, police, and laborers. 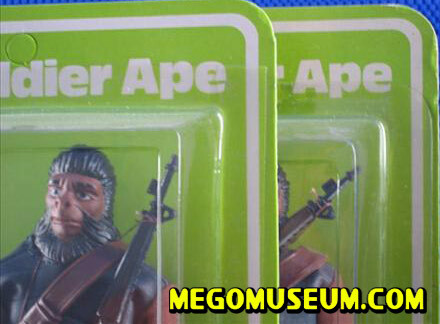 With no specific role model, “Soldier Ape” seemed an appropriate enough name. 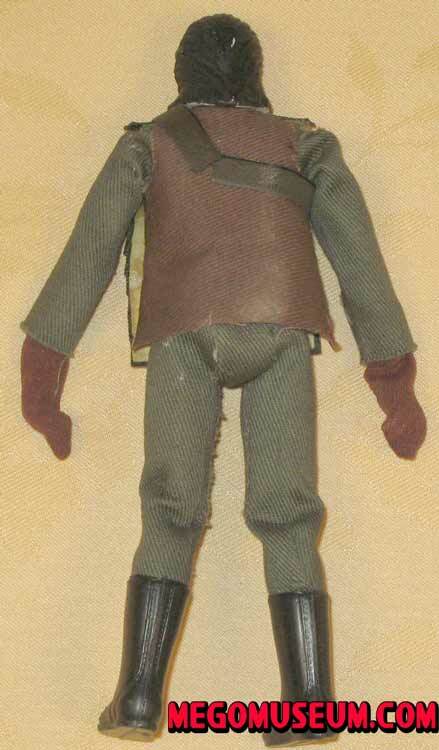 What he lacks in a name, however, Mego made up for when it came to his outfit. He is the most complex figure of the first series. 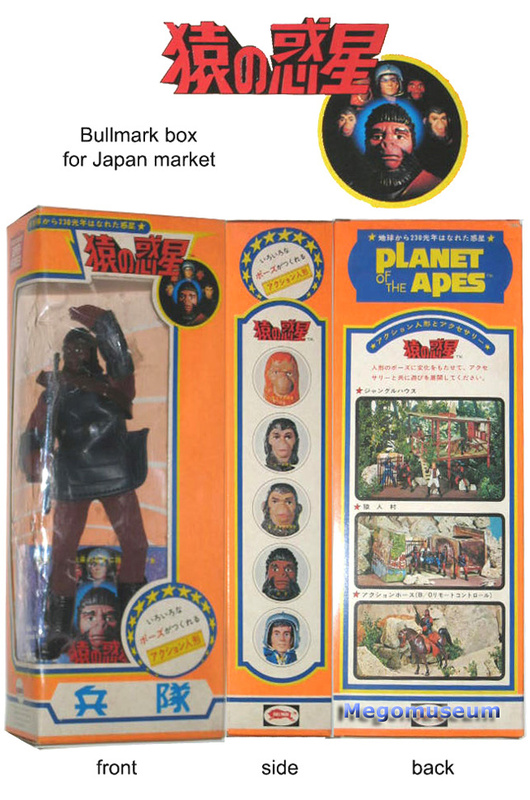 With a standard dark brown body and hands sculpted especially for the ape figures, it is perhaps fitting that his only physical shortcoming is above the neck. 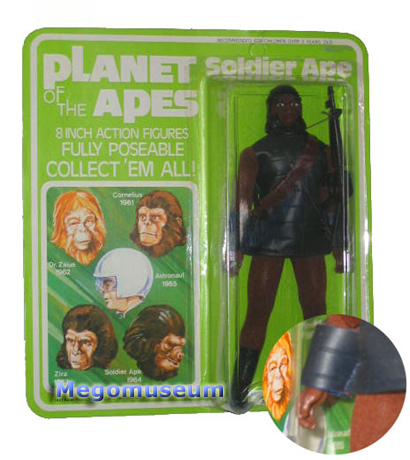 Unlike the other apes, Soldier Ape has crudely sculpted features only vaguely reminiscent of the award-winning makeup of the movie. 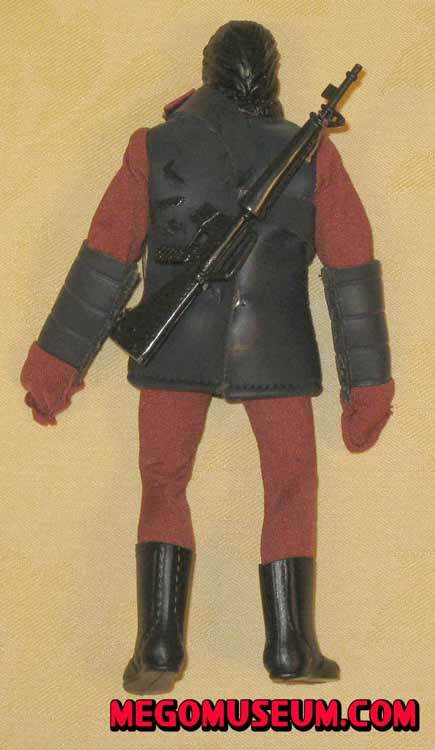 All Soldier Apes wear brown stretch pants, mid-height “laced” boots, and a tunic with brown fabric sleeves and embossed vinyl torso, and matching fabric/vinyl gloves or sewn on cuffs, along with an m-16 rifle. The sleeves and pants came in shades from a true chocolate brown to an almost burgundy or maroon tone. . The vinyl used in the Soldier Ape’s outfits has several variations: The most common version was a smooth black/blue. There is also a red/maroon, black, and a true blue version with a teal lining. The Lizard Skin outfit, as it is called, because of its scale texture has two variations of its own: The high gloss version, and a version with less of a sheen, but with silver speckles embedded throughout the vinyl. Perhaps rarest is the silver outfit which is really a dark grey. Finally, the UK had one variation with an almost purple cuffed version. He was produced on both type 1 and type 2 bodies although much more common as a type 1. 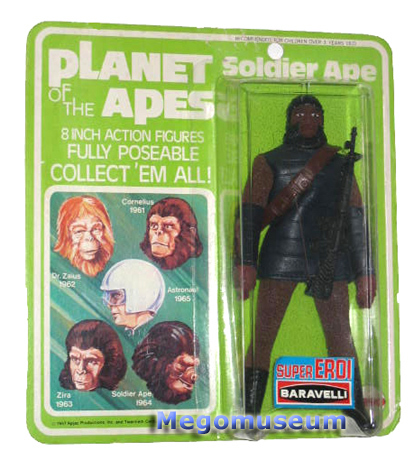 Rarest of all the soldiers is the Silver Soldier Ape, shown below. variation results from the deterioration of a standard uniform. with brown sleeves and the reddish brown pants. 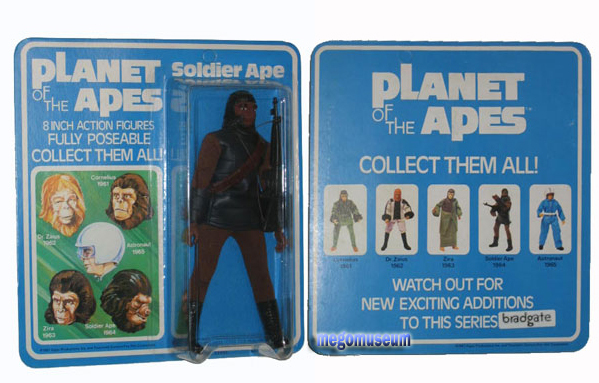 A comparison of Palitoy Apes, courtesy of Mike Jimenez, as you can see in the UK the Soldier Ape was released in a cuffed maroon version. 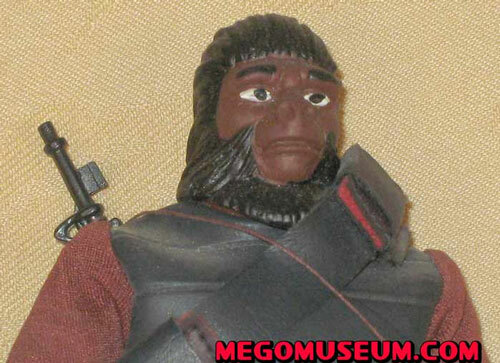 This early Solider Ape was referred to as “General Ursus”, it’s not known why this was changed. The head appears to be a sculpt made of some sort of resin (note the chip) The outfit is made of the same green denim fabric the other prototypes are made of. 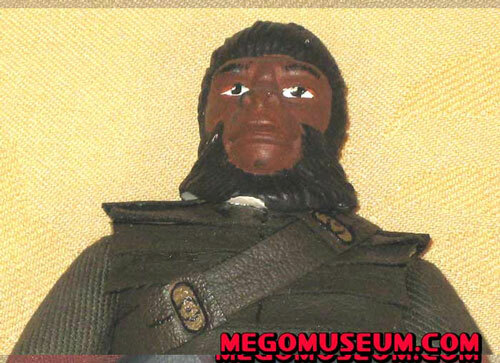 Unlike the other characters in the series, this figure seems to have a Mego produced head sculpt and the only one in the set that looks more or less like the production figure barring the obvious outfit differences. Note that it’s General Ursus in the FM ad. Version two of the Soldier appears to be a factory test shot not unlike the Carded Zira Prototype that was discovered last year. The paint is rather crude denoting a sample, the belt appears to be sewn together most likely as a proxy. 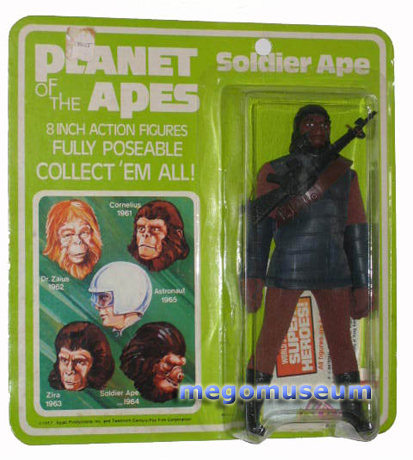 Your Soldier Ape wears combat boots! The same combat boots found in many Action Jackson military sets. 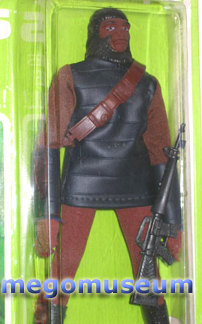 The boots have been reproduced by Classic TV Toys and by EMCE Toys. The original is made of a firm plastic, while the CTVT reproduction is a very soft rubbery material. 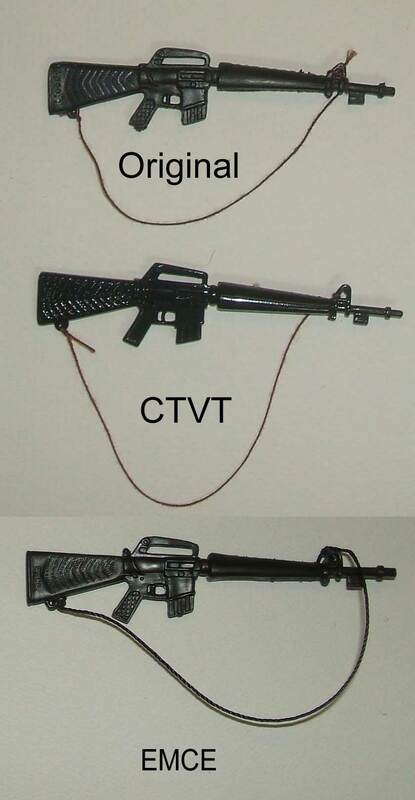 The CTVT repro is unmarked. 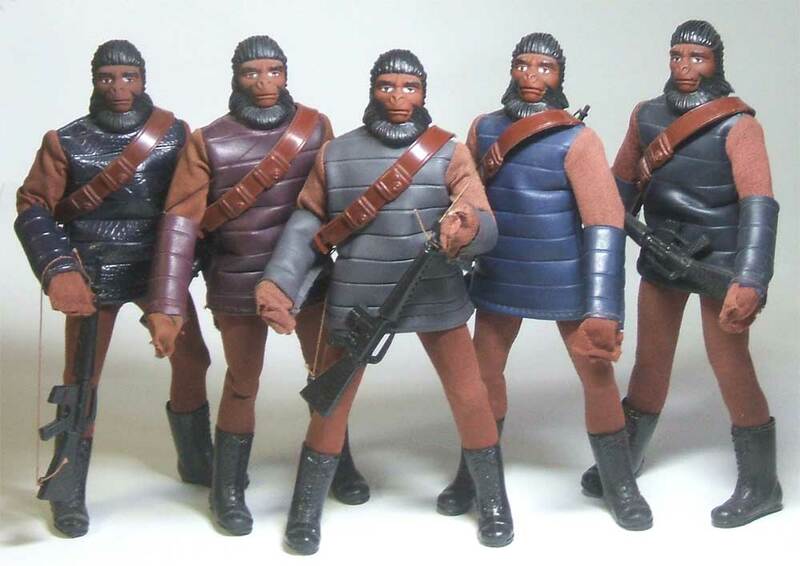 EMCE Toys reproduced these boots for their reproduction Soldier Ape figure. 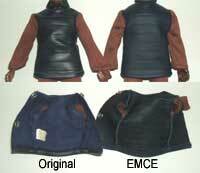 The EMCE version is very accurate in appearance, size and detail. The big “tell” with these boots are the thickness They are much thicker than an original boot. 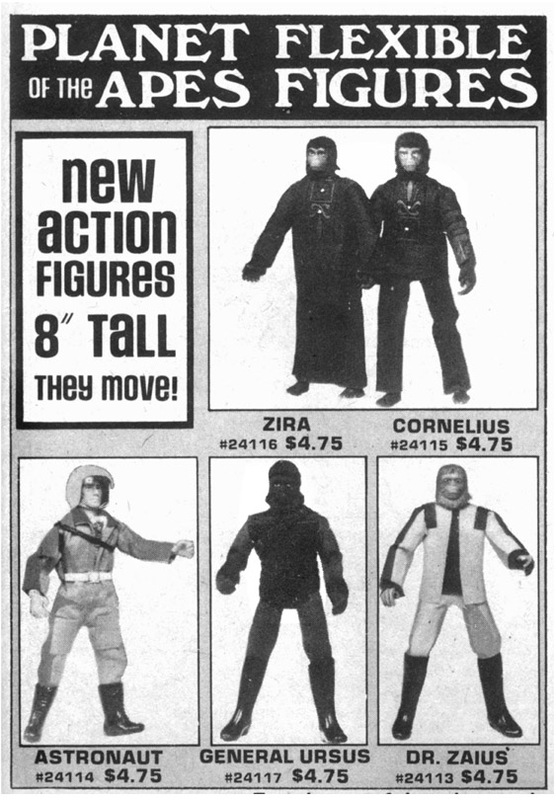 It’s the same thickness difference noted with Doc Mego’s Hero boots when compared to those originals. 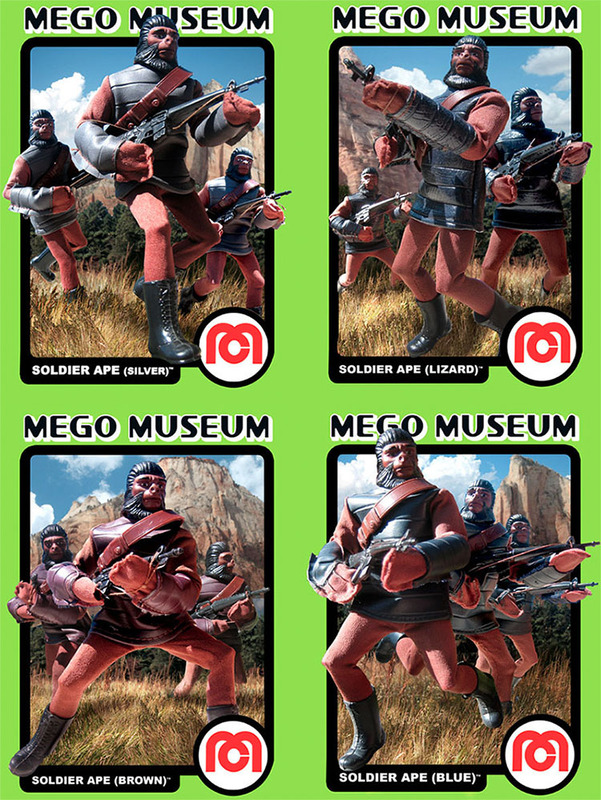 The Soldier Apes have a bando that is unique to the character. 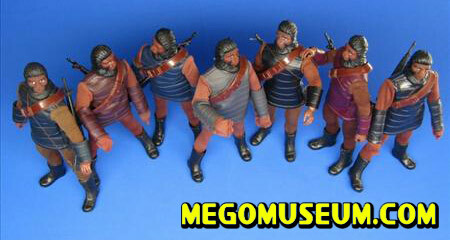 The bando has been reproduced by Doctor Mego and EMCE Toys, and very accurately. The details on the reproduction area a little more dull than on the original. 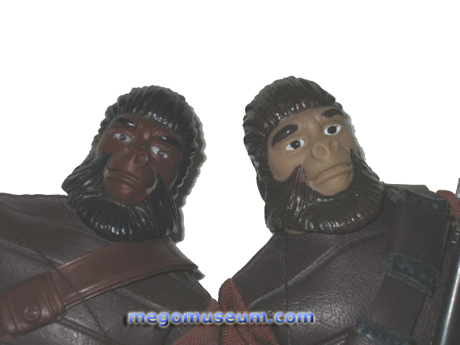 Both the Doc Mego individual sale of the bando, and the bando included on the reproduction figure are marked DM on the inside. The vinyl on the Soldier Ape’s gloves and tunic come in many colors. There are at least 2 shades of blue, maroon, blue with Lizard skin texture (glossy and non glossy version of this) “silver” (really gray), and maybe even black. If the cuffs are sewn on the sleeves of the tunic, then the figure should not have gloves. If there are no cuffs, the figure should have gloves to be complete. 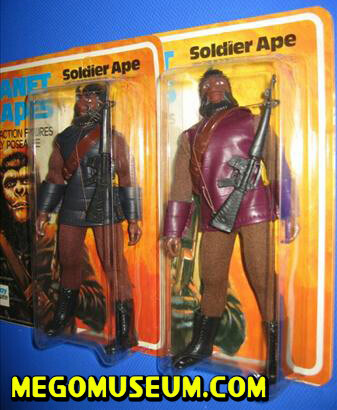 The cuffed version is less common, usually soldier apes have the removable gloves. I’ve not seen a black version of the tunic with gloves, but since there is a black version of the cuffed general tunic, logic suggests there probably is a black version of the soldier tunic and gloves. The gloves have been factory reproduced (see below). 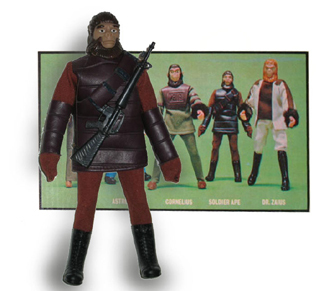 The Soldier Apes gloves have been factory reproduced by EMCE Toys. Since the gloves and the tunic are made from the same material in the case of both the original and the reproduction (respectively) the material discussion can be seen in the next section regarding the tunic. The gloves on the reproduction are a little bigger in width, and the brown mitten part is cut a different shape. 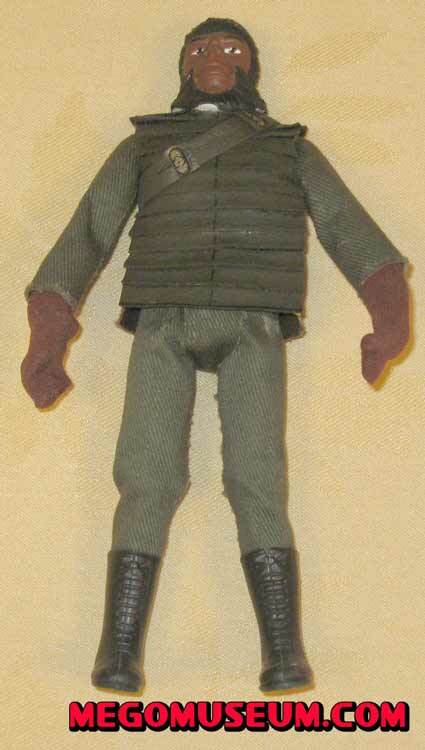 Original Mego gloves have ridges cut on the top, perhaps to similate fingers. Hard to say, but they are there, while the EMCE version is without these ridges. The reproduction is unmarked. Soldier Ape tunics come in two styles and many colors. 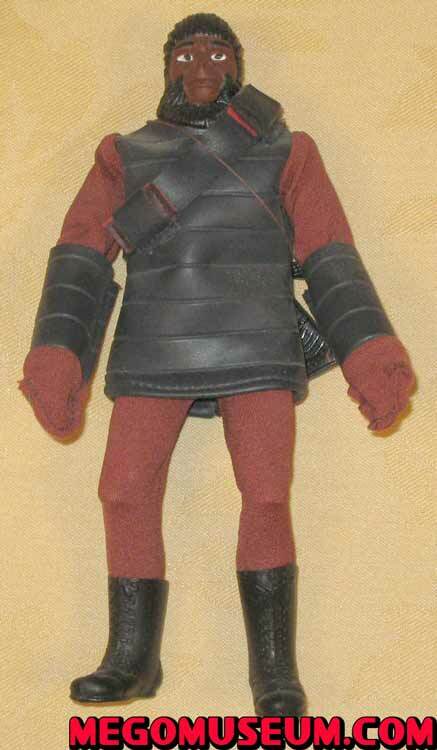 Most of the tunics are vinyl with brown cloth sleeves and have mitten style gloves that are separate from the tunic. Some come with no gloves, but instead have vinyl gauntlets sewn into the tunic sleeve (not pictured). There are many shades of color for the vinyl. Blue is the most common, but there is a lighter blue, a lizard skin blue, a variation to the lizard skin blue, maroon, silver (really grey), and even black. All of them feature brown cloth sleeves which lean towards the orangish side of the brown spectrum. This tunic has been factory reproduced by EMCE Toys. The reproduction tunic is the type with the separate gloves and comes only in blue. The repro tunic is a bit larger than the original, more in width than height. The blue is a bit lighter than the most common original blue tunic, but darker than the original lighter blue tunic. The originals tend to have a little bit of a glossy shine to them, while the reproduction has a very matte finish. The opposite side of the reproduction vinyl is a black rubber mesh, while the original is a soft blue backing (in the case of the blue tunic the repro represents). The brown sleeves on the reproduction are just a bit lighter in color overall and a bit less red/orange than the original and made of a more modern slicker material. The EMCE version is unmarked. 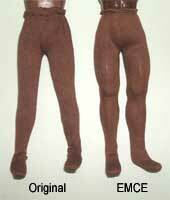 Soldier Apes wear cloth pants which lean towards the orangish side of the brown spectrum in color. 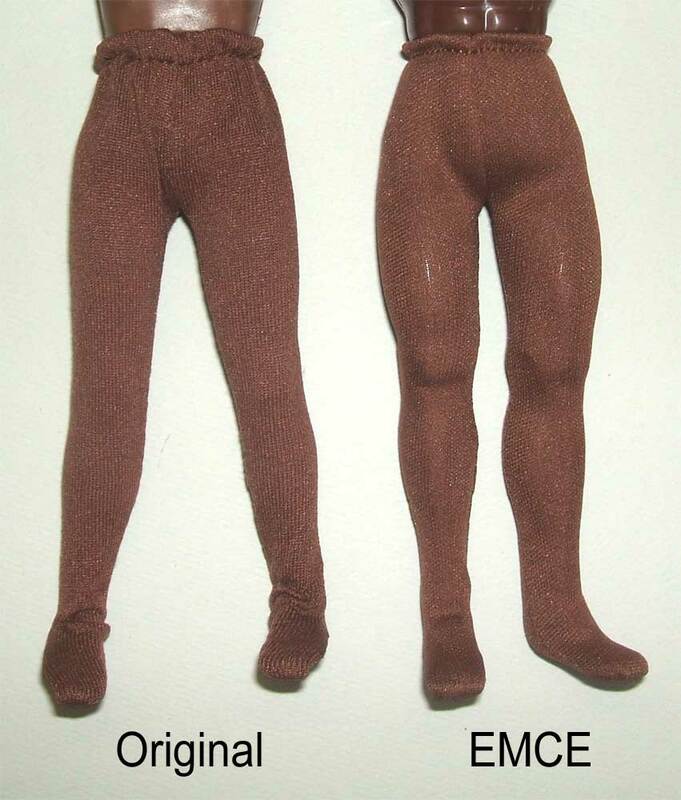 The pants have been factory reproduced by EMCE Toys. The brown sleeves on the reproduction are just a bit lighter in color overall and a bit less red/orange than the original and made of a more modern slicker material. The EMCE version is unmarked. 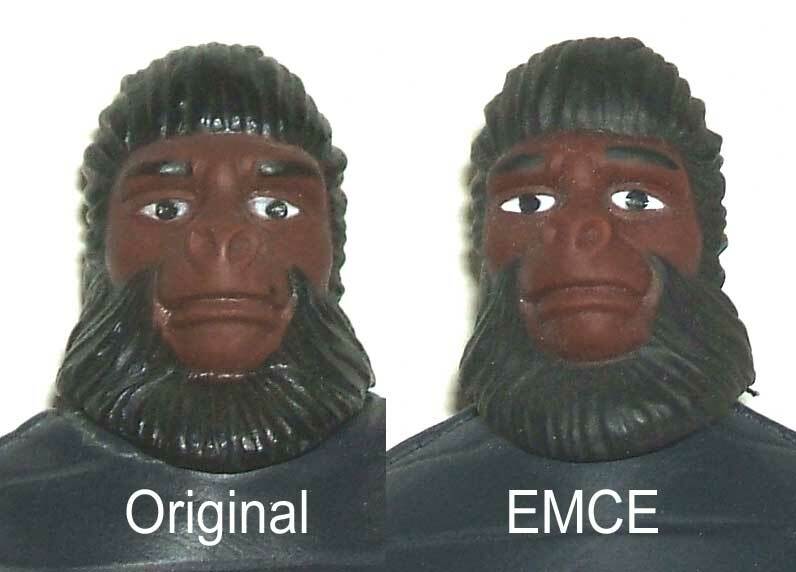 Soldier Ape heads have been factory reproduced by EMCE Toys. The reproduction is accurate in size, although the details aren’t quite as sharp. The face is a bit more on the red side of brown than the original, and the hair has more of a matte finish. The reproduction head is stamped with a 1968/2008 FOX copyright on the back.